Tower Bridge in London - the beautiful stone bridge over the River Thames. 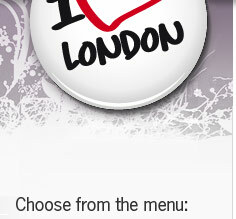 Address: Located next to the Tower of London and stretches over the River Thames. 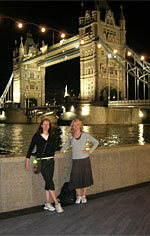 Want to see London from a little different perspective - go to Tower Bridge and walk across the bridge. From here you will see many attractions and can get great pictures. If you have the time to go here one evening, do so, it's worth the walk. 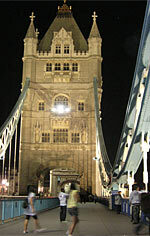 Tower Bridge was built on the site where it before was a wooden bridge called London Bridge. In 1894 the bridge was completed after eight years of work by several hundred people. It is made of steel and the outside is covered with granite and stone. The Bridge is a bascule bridge that today do not open so frequently as before. Today, there are not so many high masted ships the passes under the bridge and the large port is located outside London. The beautiful design was developed by Horace Jones and John Wolfe Barry. 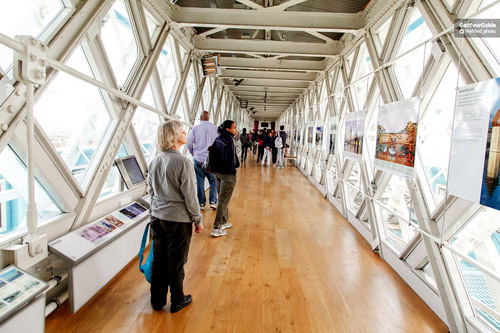 See the Tower Bridge exhibition and walk along the walk ways between the towers. That you can walk across the bridge one knows, but that you can also can get into the Tower Bridge and go inside the connecting walkways between the towers ... that you maybe did not know. Some parts of the aisles have glass floor so you can see the traffic crossing the bridge below your feet. In addition to gaze down you also get a nice view of London in several directions. And of course there are also lots of interesting information about the Tower Bridge that you can learn about when you are there. Children under 5 years, free entrance. 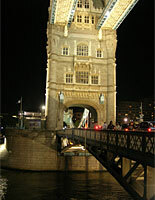 Tower Bridge weighs approximately 11 000 ton, is 244 meters long and 16 meters wide. Lower parts of the bridge can be folded down so smaller boats can pass. The bridge is built about 65 feet above the Thames. The valves are now being operated by electricity, but previously they used steam engines. There is no problem to walk over the bridge - at the top between the two towers there is a walkway. One tower has a museum. 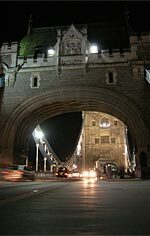 Take a stroll in the evenings when the Tower Bridge is lit up. Walk over the bridge from the Tower and go over to the other side. There is a walking path just beside the River Thames. There you can stop and take great pictures of the bridge in night light. 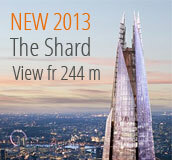 45 meters above the Thames, you can look out the windows of the Tower Bridge. 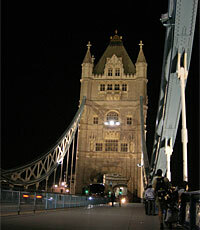 You can also walk on the famous footbridges and see the Tower Bridge from inside. Then you will find yourself at the Tower Bridge Exhibition. Here is a history display of the famous drawbridge and you can also see the old Victorian steam engines. You can take pictures from the windows out over the Thames and of course photographing some other sights as St. Paul's Cathedral, Towern among others, and the London Eye. Frank McClean flew between the upper and lower part of the Tower Bridge. To celebrate the Queen's silver wedding the bridge was painted red, white and blue. For those of you who do not have fear of heights, you can walk on a glass floor inside the Tower Bridge Exhibition and look straight down on all the cars and buses passing under your feet..
You can get here by subway lines: the District Line or Circle Line. Station is Tower Hill.